Pomegranate juice contains nutrients and antioxidants that make it beneficial for your body. The juice may also help contribute to weight loss, particularly if you consume it in place of unhealthy beverages. Talk to your doctor about the most effective way to lose weight before you begin any weight-loss plan. Drinking pomegranate juice is a healthy alternative to unhealthy beverages loaded with sugar, such as soft drinks. 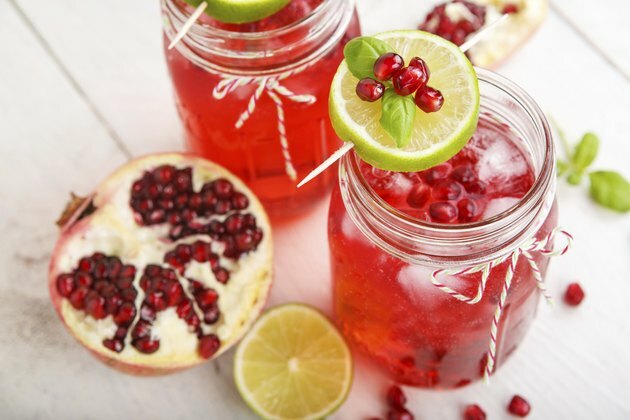 Pomegranate juice is a flavorful alternative that can help you consume fewer calories than you would while drinking a sugary beverage, resulting in some weight loss. If you don't care to drink pomegranate juice plain, add some to seltzer or plain water with ice. According to the MedlinePlus website, pomegranate juice has been used to treat obesity and help with weight loss. However, there is insufficient evidence that pomegranate juice helps directly with weight loss, and MedlinePlus indicates that more research in the area is needed. Pomegranates are loaded with antioxidants and polyphenols, and researchers believe that it is these compounds that are responsible for pomegranate's anti-obesity effects, according to the June 2012 issue of "Nutrition." Pomegranate juice can protect your heart and blood vessels. Ithelps slow the buildup of cholesterol, and contains antioxidants that help protect the body from free radicals that destroy cells. In fact, the Consumer Reports website explains that pomegranate juice contains more antioxidant polyphenols than green tea, red wine and cranberry juice. When choosing a type of pomegranate juice, check the label to make sure that there is no added sugar. Added sugar increases the number of calories in juice, which can make it less helpful for weight loss. Sugar also reduces the potential heart and cholesterol benefits from pomegranate juice, so look for 100-percent juice. It is possible to have an allergic reaction to pomegranate juice, MedlinePlus warns, particularly if you are allergic to other types of plants. The juice can interfere with some medications, so check with your doctor if you are taking any medicine. Although pomegranate juice is possibly safe to consume if you are pregnant or breastfeeding, MedlinePlus adds, talk to your doctor first to make sure. How Much Pomegranate Juice Should a Person Consume in a Day?